Angie, peace and justice activist, founder of TridentPloughshares, Faslane365, ActionAWE, author, and winner of peace prizes, believes governments must be accountable to the law and the people. Angie Zelter and Robbie Manson are both experienced peace campaigners very well acquainted with the UK's continuing breaches of international humanitarian law regarding nuclear weapons. 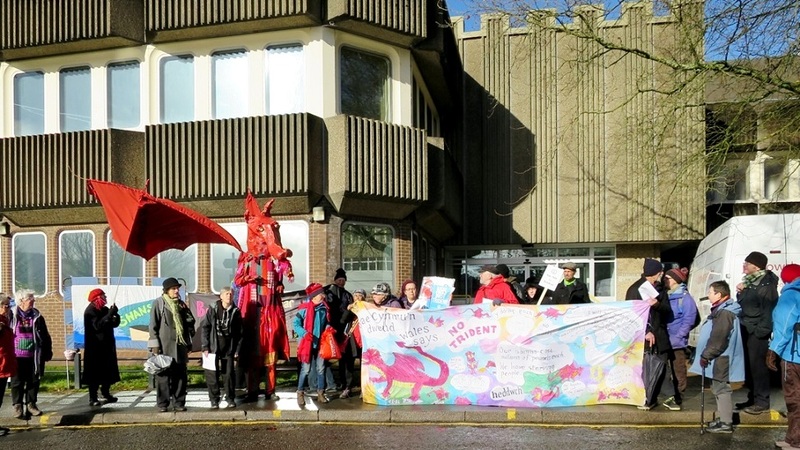 They were joined by 399 people from Norfolk, Kent, Powys, Pembrokeshire, and West Wales who, as Informant Prosecutors, went along to their local magistrates courts with an indictment of the Prime Minister and the Defence Minister for conspiracy to commit war crimes. They presented evidence that the Government plans to use nuclear weapons – which is what the deployment of the Trident system is in reality. You may remember Theresa May PM saying in Parliament during the Trident Debate in 2016 that she would be willing to authorise a nuclear strike that could kill 100,000 people? Some Informant Prosecutors outside Merthyr Tydfil Magistrates Court October 2016. The Public Interest Case Against Trident (PICAT) is a citizens' attempt to prosecute members of the UK government in a UK court for conspiring to commit a war crime. Nuclear weapons could never be used in accordance with international law, and if ever used in anger or by accident would cause millions of deaths and injuries and cause a global famine. There is compelling evidence of this that should be allowed to be laid before the courts. We took the evidence needed to prove in a court of law that Trident is illegal and criminal but the UK's Attorney General's consent is required for the case to proceed. After almost 2 years of deliberation and many communications he has refused consent and is blocking the case on the spurious grounds of insufficient evidence! Spurious because we provided 88 pages of detailed evidence. We now need to apply for and fund a court hearing (called a Judicial Review) to enquire into the Attorney General's refusal to allow us a hearing - the Pembrokeshire and West Wales PICAT groups will be doing this. The other 3 PICAT groups will gather additional evidence for another attempt to prosecute the Government Ministers. Bringing a private prosecution to court in the UK is a fundamental right of the people, subject in some cases to consent from the Attorney General. PICAT's case has been blocked for no justifiable reason in a political move by someone whose job is supposed to be upholding the law in an impartial manner. Our case is too important to abandon because a political decision has been made to block it. The first stage of this application for a Judicial Review may cost as much as £10,000. The chances of success are not high but we will make the attempt and will try to raise this initial amount. Even though any lawyers acting for us will give their time and resources freely, the Attorney General's lawyers will charge. This is why we are aiming for an initial target of £10,000. This is an all-or-nothing target, so pledges are only collected if we reach this target in 30 days. We now urgently need your help to fund this Judicial Review of the Attorney General's decision. We also need to put the Attorney General on the back foot by getting lots of individuals and groups to provide even more evidence of the crime. We will then present it to the Attorney General and for this we will also need to have funds. Therefore we are asking you to please pledge your support and network to find others to help fund this important public interest case. If for any reason the donations exceed our legal costs or if at a later stage we cannot proceed further through the courts, the money raised will go into the next phase of the campaign to produce mountains of evidence against the government, or to further the campaigning of Trident Ploughshares as a whole. £25 was never better spent--unless on a cordless drill to make a hole in each of the wee submarines!